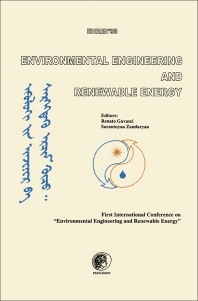 This book contains the papers presented at the First International Conference on Environmental Engineering and Renewable Energy held in Ulaanbaatar, Mongolia in September 1998. The main aim of the conference was to give an opportunity to scientists, experts and researchers from different fields to convene and discuss environmental and energy problems and also be informed about the state of the art. Today, environmental protection is increasingly becoming a matter of global priority now that the tendency towards sustainable development is growing. The main concept of sustainable development is to fulfill both the demand of today's generation and cater for the requirements of future generations. Hence, sustainable development requires sound management of those environmental and research and development technologies which have low environmental impact and which promote the use of renewable sources. Renewable energies are the only environmentally benign sources of energy and are available at any site and any time of the year. Moreover, the utilization of renewable sources of energy can contribute to the increasing energy demand and also advance the improvement of life standards in rural areas, where it is difficult to establish a permanent connection with central electricity systems. Application and adoption of emerging renewable energy technologies in rural and remote areas cannot be successful without transfer of knowledge, information and know-how. Environmental engineering involves research and application of technologies to minimize the undesirable impact on the environment. In recent years, there has been a growing interest in environmental engineering problems in order to focus on theoretical and experimental studies on atmospheric pollution, water management and treatment, waste treatment, disposal and management. For scientists, experts and technologists with an interest in new developments in environmentally clean technology, renewable energy and sustainable development. Section headings and selected papers: Sustainable Development and Environmental Protection. An attempt for environmentally friendly utilization of oil-shale in Mongolia (B. Avid et al.). Environmental compatibility of controlled landfills in relation to the vulnerability of the aquifers: a proposed approach (G. Boari et al.). Identification of microbial indigenous species in an aromatic hydrocarbons contaminated soils (M.R. Boni et al.). Toward sustainable energy for development: a modern approach (U. Farinelli). Renewable Energy. On UNESCO's renewable energy information exchange programme - the international renewable energy information and communication system (Ireics) programme (A. Suzuki). Pretreatment investigation and field trialing of an innovative solar-powered reverse osmosis desalination unit (S. Dallas et al.). Air Pollution Control. Managing air quality in European Union (M. Giugliano). Removal of nitrogen oxides produced during waste incineration: operation of a full-scale DeNOx system (A. Fiore et al.). Water Management. Alteration phenomena of drinking water quality within water systems (G. d'Antonio, F. Pirozzi). Man-made recharge of the groundwater resources of central and upper sources for Ulaanbaatar city water supply (Ts. Batdorj et al.). New regulation for water management in Italy (G. Giannella). Water and Wastewater Treatment. Drinking water and waste water disinfection: strategies and problems (C. Collivignarelli et al.). Present trends in reduction of acceptability limits at the discharge of wastewater and technological implications (F. Conti, R. Iannelli). Water treatment in remote and rural areas: a conceptual screening protocol for appropriate POU/POE technologies (F.G.A. Vagliasindi et al.). Solid Waste Management. Heavy metals partitioning in waste incineration (L. Galeotti et al.). Authors index.